Searching for your yearly dose of scare for Halloween? Have a look at I’m Thinking of Ending Things! Best described as a psychological thriller or maybe even a psychological horror novel, I honestly believe this novel is one of a kind. My story is not like a movie, I’ll say. It’s not heart-stopping or intense or bloodcurdling or graphic or violent. No jump scares. To me, these qualities aren’t usually scary. Something that disorients, that unsettles what’s taken for granted, something that disturbs and disrupts reality—that’s scary. I’m Thinking of Ending Things opens on a fairly mundane premise: the narrator, an educated young woman, is on a trip with a like-minded gentleman called Jake (yes, their nerdiness is significant in the story). They are on their way to his parent’s place for the first time as a couple. However, the mood in the car is slightly uneasy: she isn’t terribly committed to this relationship. Actually, she might be considering “ending things”. 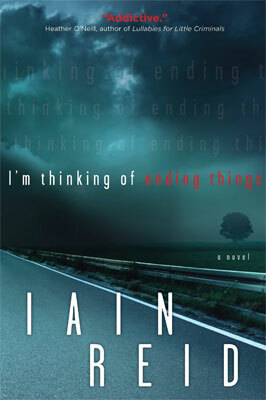 The brilliance of I’m Thinking of Ending Things lays in its freezing-cold, intense and suffocating atmosphere. The feeling of claustrophobia seems forever increasing: in the first chapters, the two characters are driving on a completely deserted road toward a remote family farm lost in the nameless middle of nowhere. The narrator is wrapped in a snowy cold night with no idea of her whereabouts, in a car with a man she’s pondering to ditch. When the conversation between them turns awkward, the vulnerability of her situation stands out painfully. The claustrophobic feeling also stems from the narrator’s obsessive mind. She is haunted with nightmares, bleak memories and concerns about recent phone harassment, and that’s when she’s not obsessively weighing pros and cons about parting ways with Jake. Once this thought arrives, it says. It sticks. It lingers. It dominates. There’s not much I can do about it. Trust me. It doesn’t go away. It’s there whether I like it or not. It’s there when I eat. When I go to bed. It’s there when I sleep. It’s there when I wake up. It’s always there. Always. There’s something toxic about her mind that you want to escape… She has a disturbing habit to scrutinize people, noticing for instance how “[Jake’s] body makes sounds like a cooling car after a long drive” after eating. She also makes peculiar choices of word, like describing his “prominent Adam’s apple, more a gnarled peach pit stuck in his throat”. Yet the suspense keeps you turning the page. You just need to know. More. About everything. First, who is she? Her intimate thoughts we know in details and yet, we don’t even know her name. She has an intriguing personality, and a long list of obvious yet unspoken struggles in life. There is definitely more to her than meets the eyes. Then, there is this tension with Jake, a mix of complete complicity and unbridgeable difference, almost hostility, stressed in this particular setting. In all fairness, Jake isn’t the charming type either. He is an expert in avoidance: when he isn’t comfortable with a conversation, he suddenly changes topic, turns the radio back up, or simply becomes silent. He also has a thing for gloomy statements such as “you also know things are real when they can be lost”. To make it simple, you can’t miss I’m Thinking of Ending Things. It is just brilliant. It’s terrifying in very subtle ways, it’s smart and remarkably written, it’s original and completely mind-bending. The only downside: it’s the one and only fiction of Iain Reid so far, which can leave you with a nasty withdrawal feeling at the end of the book. It’s hard to get into anything else afterwards. Including your car, in a cold snowy night. With your boyfriend. To visit his parents.